I only have Unbleached White Whole Wheat Flour… Is this ok to use for these? I just found your website this week and made your banana muffins. They were AWESOME! I do not have WW flour or pastry flour only all purpose can I use that since I have it on hand or do I need to go and buy ww pastry flour? OMGoodness! I finally made these and they are amazing. I found your website a few months ago and have not been disappointed yet! Thanks for all the fun recipes and kid-friendly grub. Getting my 2 and 4 year olds to eat a nutritious mean has never been this easy! The chicken nuggets are now a mainstay in my house. I made these muffins with whole wheat flour (didn't realize there was a differnce). Clearly, I am not a very experienced cook, but they turned out awesome! They are a bit dense and don't have the smoothest texture. I still found myself inventing reasons to have just one more! If I keep them longer than overnight, I refrigerate or even freeze them. When you said you wrapped the leftovers in plastic wrap, are they refrigerated or on the counter? Thanks. I just finished mine and I'm 'waiting' for them to cool!! Made these yesterday with sifted whole wheat & all purpose flour. Another hit! Made these and LOVED them. So yummy and a great treat for breakfast. Took me a bit to find the whole wheat pastry flour, but I did! Definitely will make again! LOVE IT! I split all ingredients in half and went with 3/4 whole wheat pastry flour and 1/4 oat bran mix. came out really nice! I made a similar recipe and substituted sugars both white and brown and they came out great. They took at 5/6 point muffin down to a 1-/12 points. I would still add sugar. Not exactly sure how much though. I could not find unsweetened applesauce anywhere 🙁 Do you think it would be safe to just use and then not add in any sugar, or maybe just 1/4 of sugar? Just made these tonight, and they are delicious. I think next time I'll add a pinch of sugar to the top of each muffin before baking. I didn't have whole wheat pastry flour, applesauce or enough blueberries lol. but I used half white/half wheat sifted, 3 mashed overripe bananas with 1/4 cup oj and i used about 1/2 cup chopped strawberries to supplement the blueberries. They were delicious! Even my ten yr old who thinks fruit is a vile thing ate them…lol. We don't have applesauce in the UK. What can I use instead? I love that idea, I may try that next! So I didn't have enough applesauce or blueberries so I did 3/4 cup of applesauce and 1/4 cup orange juice. And I did 1 cup of blackberries, raspberries, blueberries and cranberries. Lol kind of a quad-berry muffin. They smell great can't wait to have them for breakfast. I don't think it's the same, pastry flour is lighter in texture but it still may turn out fine. Hi Gina, I cant wait to make these. I found whole wheat all purpose baking mix, is this the same thing as pastry flour? Thanks for your help. Yum! These came out perfect! Thanks! I would keep them out overnight, a after that I would refrigerate or freeze the rest. These look delicious & I'm definitely going to give them a go at the weekend. I'm trying to lose weight and I find breakfast can be difficult as a lot of cereals contain lots of hidden sugars. Just one question though – If I make a batch how long do they keep before spoiling & can I freeze them. Also can I make up the mixture the night before and bake them the following morning? I bet they were delicious kristen! I made mine with the 1 cup oatmeal, 1 cup whole wheat, 1 tsp baking powder,1/2 tsp soda, 1 cup apple sauce, 1/2 cup sugar, 1 cup mixed rhubarb – strawberries (mostly rhubarb, 2-3 strawberries) and then 1 egg replacer egg (2 T water with 1 1/2 tsp egg replacer) then i added about 4-6 T of coconut milk. Delish. 122 calories I figured out, no butter or oil, just pure healthy. I thought about substituting the honey…. but it's actually more calories that way and we don't have a lot of honey. oops, forgot the vanila, but did add the salt. made about 11 muffins. These are wonderful! I tried them with fresh strawberries and slivered almonds and let the kids slather them up with some cream cheese, a delicious breakfast alternative and total crowd pleaser! Thank you for sharing! I have made these twice and they are absolutely delicious! I decided to make them without the liner papers the second time because I didn't like how they stuck the first time. This time I doubled the recipe, made two dozen and froze them, individually wrapped in plastic wrap. Now I just pull one out each morning and nuke it for about 30 seconds. I've got enough for a month's worth of breakfasts! I'm going to try modifying the recipe to make them Cinnamon Raisin for my mom who doesn't like blueberries. One more thing…. I sprayed the liners and they come out beautifully. Thank you for the tip! Excellent! What a great recipe. Took them out five minutes ago and tried the first one. Really delish. Didnt have the WW pastry so I used 1/2 n 1/2 and sifted. Fresh blueberries are "bangin". Due to serious deficiencies in my pantry, I made a few substitutions. For the whole wheat pastry flour, I used a mix of atta and all purpose flour. (Slightly more than half atta, because I am almost out of AP flour. I have had good experiences baking with atta.) I added two extra tablespoons or so of applesauce. I didn't have white sugar, so I used turbinado (and sprinkled a tiny amount on top of each muffin before baking.) I also added a pinch of cinnamon to the dry ingredients. Used frozen blueberries (thawed) instead of fresh. Jody ICBINB would be fine. I'm dying to make these, but do not have butter in the house. Since I only need 2 TBSP, do you think I can't believe it's not Butter would work? Or vegetable oil? Or perhaps, half of each? Thank you in advance! Just made these with sifted half wheat/half white. I was worried b/c the batter consistency was a little gummy. I added an extra 1/4 cup applesauce–they turned out delicious. Also, I used frozen blueberries, just defrosted them in micro. So very moist and a really delicious, healthy flavor. Makes me feel like I did something great for myself today. Tanner's mom, you could use whole wheat flour but they won't be the same. The pastry flour makes them a lot lighter. When I have whole wheat, I usually do a blend of white and whole wheat. Ashley, why don't you experiment with a half batch and see. Baking is tricky! Ok. I*m not much of a baker at all. So I was wondering if anyone thought this would work. 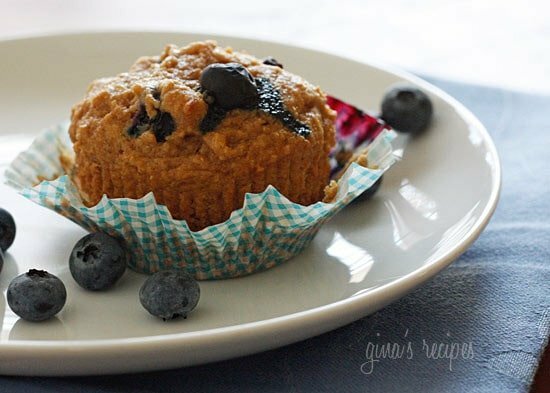 I wanted to make these muffins but I wanted to add coconut water from a fresh coconut and also shredded coconut. But I*m sure the added liquid fron the coconut water would make them too liquidy (right?) so I was wondering could I add that fiber powdered stuff to even out the liquidyness from the coconut water AND also just to add fiber? (Very amature baker here, I know the best way to find out would be to just make them but I hate to fail at a recipie I*m dying to eat! LoL) Thanks!! Would Whole Wheat flour work? I'm not sure what pastry flour is. It looked like someone else used whole wheat white flour & it worked out OK? Is that the same thing as whole wheat flour? These were excellent! Thanks for another great recipe, Gina! I am enjoying one right now, fresh out of the oven….couldn't even wait for it to cool. It is delicious! I halved the recipe, substituted Egg Beaters for the egg, added a pinch of cinnamon and added a couple blackberries along with the blueberries. I only had 4 muffin liners, so sprayed them and the muffin tray and all muffins came out without sticking. Very quick and easy recipe, although I went to 3 stores before finally finding ww pastry flour at Whole Foods (should've known to check there first). I made these with 1/2 whole wheat 1/2 white flour and they were great. I also added about a 1/4 cup of ground flaxseed just because and I still found the wet ingredients to be enough. I have learned with muffins to ALWAYS spray the liners so they don't stick. Otherwise you lose half the muffin on it. Thought they were perfect! I substituted some frozen strawberries, and used Splenda for sugar, and made absolutely delicious mini-muffins! Moist, dense, very satisfying! These muffins are wonderful! I've made them for dessert for my children twice this week. It's a win-win. Thank you Gina!! Kara, thanks for sharing. Nice touch adding some flax! I made these yesterday and they were excellent! To avoid the muffins sticking to liners I simply spray the tin with baking spray and forgo liners all together – works great! These muffins have a nice height, and are delicious! I halved the recipe and used ground flax seed mixed with a little milk for the egg. I will definitely make these again. 🙂 Thanks for another excellent recipe, Gina! I made these yesterday and they were absolutely amazing, the only drawback is they stuck to the muffin wrapper horribly, does anyone have a solution to that? Try If You Care muffin liners as they are non stick. The look and feel like parchment paper. They work great on low fat recipes. I use silicone muffin forms,they work great and you can use them over and over again.good luck!! I don't use liners. Just spray muffin pan with cooking spray. Works great! I'm happy you all liked the results! Agave can replace the sugar, they say it's sweeter so you need a little less. I'm not sure how it will effect the muffin though. If you try let me know. I made these over the weekend, using Bob's Red Mill stone ground whole wheat pastry flour, which I purchased specifically to make these. They were amazing and delicious. Can't wait to make them again. These are so good. I made them today and they still came out good even thou I did not have any baking soda. I used baking power (2 tsp) and omitted the salt. Next time I will made sure i have the baking soda and I expect them to be ever better than today's version. Thanks Gina! i have these in the oven right now with some of the giant strawberries that are on sale right now in my neck of the woods. i can't wait to try them when they come out. We'll see if my boyfriend likes them since they are *healthy*! he doesn't eat most vegetables and fruits, but he usually will try things if i ask. Delicious! I used whole wheat white flour and frozen blueberries. One of the best muffins I have ever made and with only 2 TB of butter! Gina you are a genius! I have made so many of your recipes and have not found one yet that I don't love. Thank you!!! I made these tonight and thought I didn't have sugar so I used Splenda instead (I found the sugar when I was cleaning up >.< whoops). They still turned out really well except for sticking to the wrappers. I added a touch of cinnamon because my family is nuts for it. Can't wait to take them to family dinner tomorrow night! Thank you for all of your recipes. I can't even count how many I've made and loved! I made these today and yum. I did the 1/2 white/wheat combo but the wet ingredients weren't enough so I added a good splash of orange juice (maybe about a half a cup? I didn't measure). V. tasty, thanks for the recipe! Gina do you know how I can substitute the sugar for Agave Nectar? I want to start to substitute this in all my baking but have no idea how … I'm not sure if it's equal to sugar or if you have to add less or maybe increase/decrease cooking time. Any help you could provide would be wonderful!! Thanks for your help and all of your WONDERFUL recipes!! I made these this morning for breakfast. They were awesome. Thanks, Gina! These look really delicious! 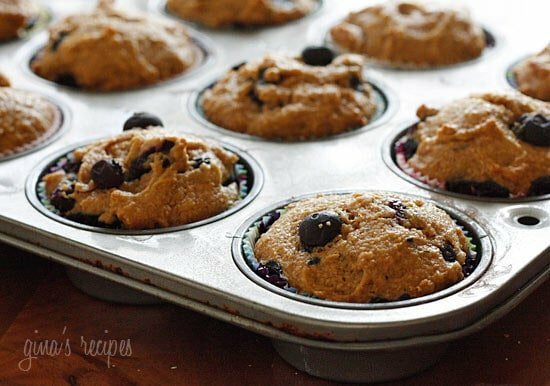 I love using applesauce in muffins — so moist and fluffy! I made these tonight, I'm not sure what went wrong. They came out very gummy. The toothpick was clean when I tested them after baking, and the blueberries were dry when I folded them in, and I was sure not to overmix the batter. I picked up a bag of the flour listed in the recipe tonight when I went grocery shopping so I did not substitute. I had high hopes and want to give these another try, any suggestions to avoid the gummy texture? The same thing happened to me! I wonder what caused it. Yes, it's great with pumpkin. I recently did a papaya coconut muffin. You can use any pureed fruit! I don't have blueberries so I'll have to try these as banana. These look delicious! I love that you use applesauce in your recipe. It's a great way to get kids to eat more fruit!! Have you tried this recipe with pumpkin? Just made these with regular whole wheat flour – not good! I will be making these again with the pastry flour! Oh and egg beaters may work, the texture might be effected slightly but I'm not sure. If you use egg beaters let me know how they turn out! 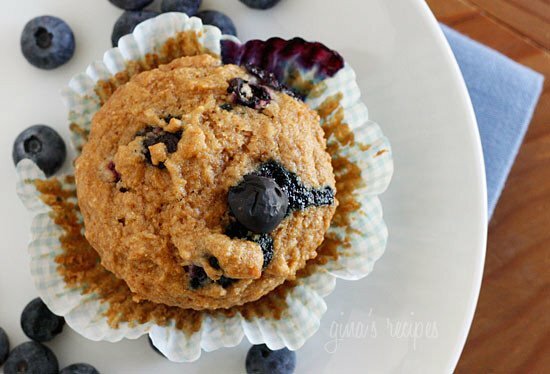 You can swap chocolate chips for blueberries but the points will increase. I think they will be great though. Kristin – lol I guess beat the egg and use half. I personally never use Splenda in any of my baked recipes, I prefer to use real sugar. Splenda gives me migraines but if you prefer to use a baking Splenda blend, of course you can in any recipe. can you use splenda and egg beaters to lower the points more? If I half the recipe, what do I do about the egg? Thanks! I made these with half white and half wheat flour and I didn't have butter so I used 1.5 tbs of vegetable oil. I also had to bake them for about 30 minutes, 25 was not enough in my oven. I also sprinkled with brown sugar (like a pinch per muffin). They are really great, I'm enjoying one now with a cup of coffee. I'm not familiar with WW, so I don't know what that does to points, but they are awesome! My 1 year old loved them 🙂 I LOVE this blog, thank you for sharing these delicious recipes. These look awesome!! Do you think I could swap the blueberries for chocolate chips? My kids have been BEGGING me to make chocolate chip muffin and I have been on the hunt for a healthy AND tasty recipe. I dont have whole wheat pasty flour, only regular whole wheat flour. Just found your blog and I can't wait to try out some recipes! 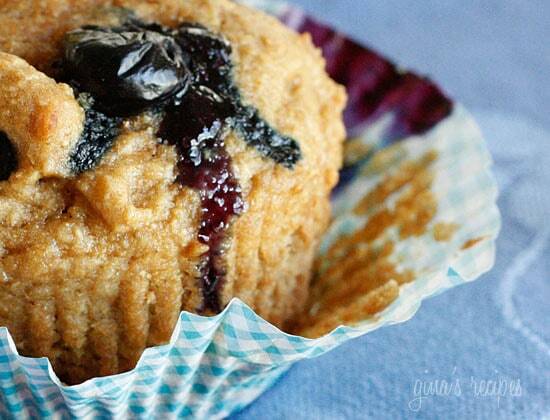 Blueberry muffins are my favorite! 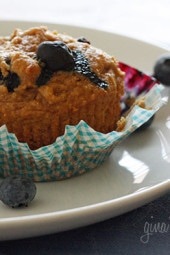 Just love how muffins can be a healthy consumption..keep it up..great work you've shared here.. Funny. I just googled pastry flour this afternoon because I didn't know what it was. The website I found said you can "appoximate cake and pastry flour by adding 2 T. of corn starch to a scant cup of All Purpose flour." Don't know if it works the same with the whole wheat flour or not. I hope that helps. You can use whole wheat instead but they won't be as good. I mentioned above, you can do a blend of half white, half whole wheat and sift before using instead. Frozen blueberries would work, I'm sure strawberries would be fine too. I don't use Splenda but I'm sure it would work. I'm not sure where the muffin wrappers are from, I had them lying around. OOOOOOOOO, I like!! great idea to make them whole grain. gonna try that. Love the wrapper, so cute! Where are those muffin wrappers from?! They are so adorable! I don't like cooked blueberries, but these look great! I heart your blog! These look amazing! I would think whole wheat flour should work ok, but the texture might not be as nice. These sound great – going to try them this weekend and compare to my current fav (using 1/2 whole wheat pastry, 1/2 white). It's worth it to see a recipe 'as is' before you do a dramatic tweak. Pastry flour has a lower amount of protein so it absorbs less liquid. If you used regular whole wheat flour, you might want to decrease the amount slightly. Your muffins are going to be dryer and denser. Mmmm these look great–could I exchange fresh strawberries?? And would I use the same amount of strawberries as blueberries? I do have those on hand now. These need to already be in the oven. (giggle) But I will await your reply….with great anticipation. Again thanks for all you do for "us". I dont have whole wheat pasty flour, only regular whole wheat flour… Can I use that? I made these today with whole wheat flour. The batter was too thick, so I added some water and a bit of milk. The muffins were really, really good! OH YEAH.. I see after school snack is gonna ROCK tomorrow.. I'm gonna do it w/strawberries my kids aren't too big on blueberries go figure? lol.. OMG!!!! I have GOT to try these! I love your recipes. LOVE IT!! YUM! I need to pick up some blueberries. Stat.